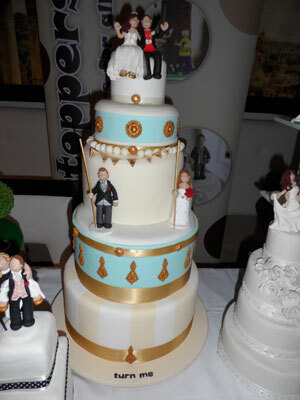 Well just got back from the wedding fayre at the Avalanche restaurant in Manchester and had lots of interest in our Wedding Cake Toppers and Personalised Cake Figures! Not only were people interested in the cake toppers, but also our brand new products which we launched exclusively today at the fayre. The first of our new products is our ‘fake’ wedding cake. People spend hundreds of pounds on a cake people will not remember but with our fake cakes, you can even keep it as a keepsake after the wedding! The cakes are made from the same material we make the wedding cake toppers from and can be customised to your exact design. Don’t worry about not having any actual cake to serve on your big day as you can simply buy a couple of cheaper, tastier cakes from the supermarket and nobody will ever know the difference! The second product launched today was our ‘Mr & Mrs’ top table centrepieces. 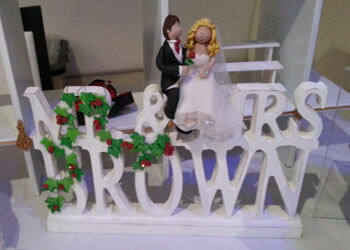 Again, these are completely bespoke to you and your name and you can even combine them with one of our cake toppers! Again, it can be a great keepsake after the wedding. We’ll be adding more details of both of these products soon, but if you have any enquiries in the meantime, just get in touch!